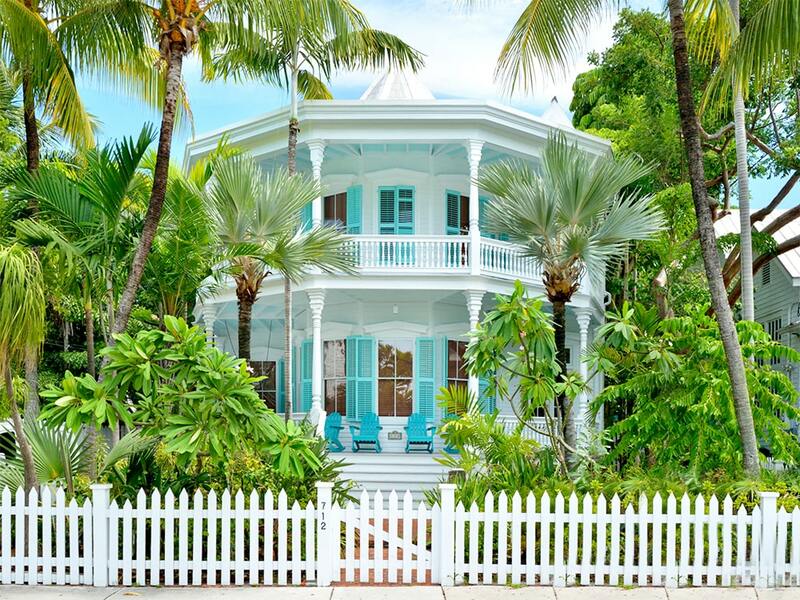 When taking a selfie at the iconic Key West Mile Marker 0 isn’t enough, now you can luxuriously live right next to this landmark! This stylish 2 bedroom, 2 bathroom suite, is discretely perched above the Mile 0 location, above the island bustle, yet with an enviable birds-eye view of the famous scene below. 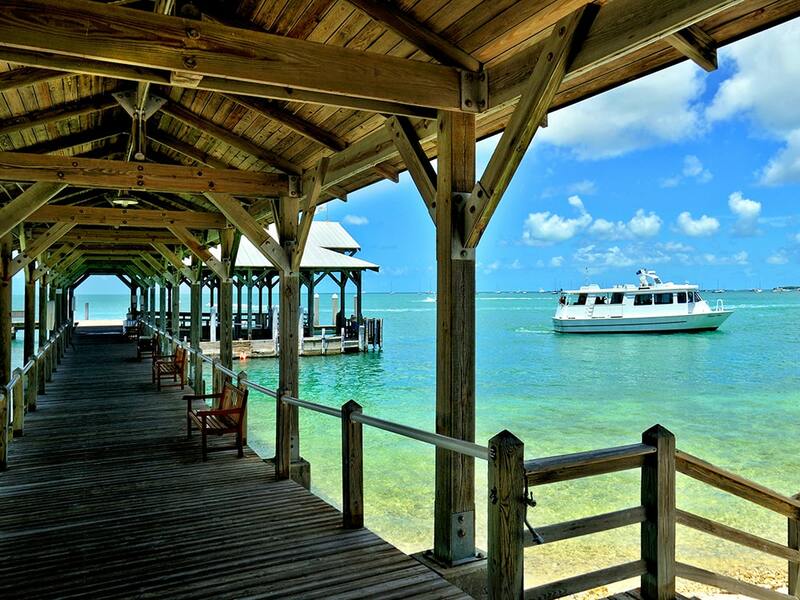 Key West is sometimes called ‘Mile Zero,’ a namesake for its geography ‘at the end of the road,’ where dreams begin for many. But while MM 0 is a famous location, Mile Zero is also a treasured sentiment from the 1970’s generation – a time when some of our most notorious residents, lived life as moveable feast, an art form on our tiny island. 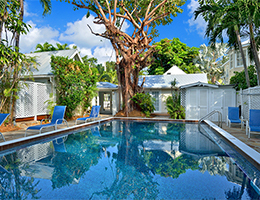 Even If you're too young to remember those ‘good-old days,’ when the likes of Hunter S. Thompson, Jim Harrison, and Jimmy Buffet lived here, this is a great spot to catch an inspiration for the Key West-Mile 0 state-of-mind that lives on. The artistic focal points are two custom life-sized hand painted murals. One piece features the Mile 0 monument with all its prominent characteristic, and encompasses an entire wall, from floor to ceiling, in a living room/ kitchen area. The other mural is of a life-size fantasy garden mural in the bedroom two, complete with picket fence, which gives a convincing illusion of sleeping in a tropical garden. 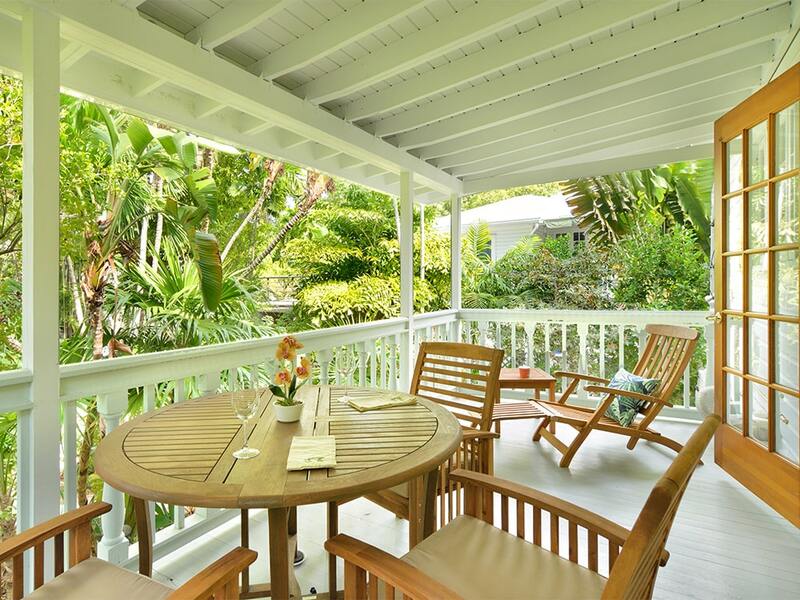 You’ll know you’ve left the bustle outside, when you step inside the front door of this completely renovated early 1900’s wooden island house. Curbside appeal is beautiful, with a covered front porch and manicured tropical landscaping. The main entrance is through the front door that takes you right up to the 2nd floor via a beautiful traditional wooden staircase, to the colorful landing at the top. At the top of the stairs, to the left, the pretty hallway leads you to the main open concept kitchen / living room where you find the life-size mural the Mile 0 scene. Plenty of windows invite in the sunlight and overlook the back deck. Furnishings are retro 1960’s style, complete with apple green davenport and oval shaped coffee table. Rooster print side chairs are a reminder of how much Key West fancies its free-roaming protected chickens. Fanciful artwork and custom decor reflect the tastes of the ‘peace-and-love’ decade. A drop leaf table placed between the living room and kitchen is set to be easily pulled out and chairs placed around if you want to make a sit down dinner. The fully appointed kitchen offers everything you need to cook a breakfast, lunch, or dinner. Vibrant tropical colors like ‘sangria red’ and ‘Florida Keys blue’ were paired with soft historic Victorian tones of Georgian Green and Hawthorne Yellow, to create a colorful back-drop throughout the apartment. An eclectic arrangement of original art work and imported and antique furnishings were carefully grouped to create a special mood of laid-back luxury for each room. Dark hard wood floors in the living room/dining/kitchen and berber carpets in the bedroom provide a classic yet contemporary Key West feel. Both bedrooms, with en-suite bathrooms, are located off the hallway that runs the length of the suite. Bedroom One, at the end of the hallway is the largest of the bedrooms, and provides a king size bed. Designed to feel like a luxurious island beachside room, it is set with a sea-grass headboard, white cottage-style dresser, sea inspired art work and sand-tone accessories. The room is L-shaped, and tucked away in the corner, is a white vanity / computer table, the perfect place to catch up on some work. The private en-suite bathroom, with a double size shower and free-standing sink, is located next to the vanity. Bedroom Two is spectacularly creative, when you enter it, it feels like you’re walking into a ‘Still-life’ garden painting. 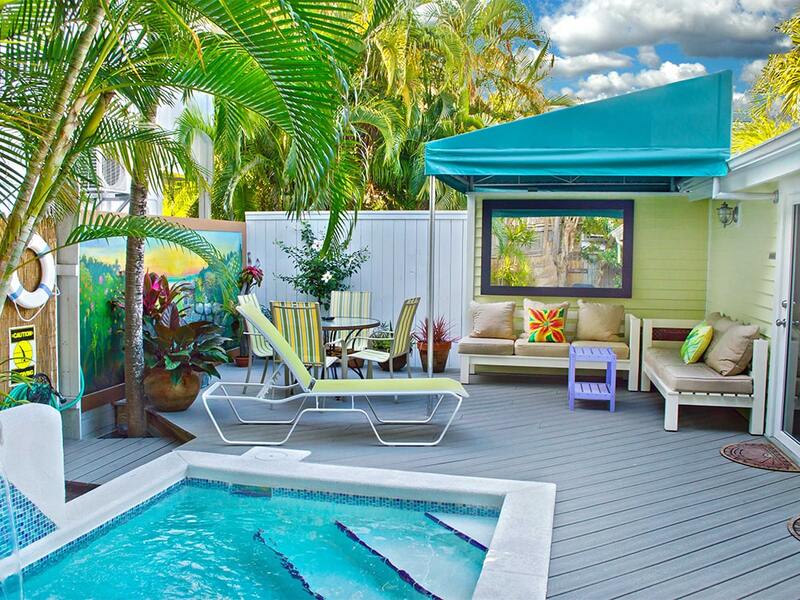 Definitely the wild-card of this property, the owner loves the enchantment of Key West gardens and the idea was to make it possible to sleep in the garden while comfortably staying inside. To create this sleep-in art piece, a master carpenter built a custom ‘picket-fence’ headboard. Then artist David Wegman painted an alluring fantasy tropical garden as the background, complete with hand painted bricks you would swear are the real thing. When you sleep ‘in the garden’ you have two twin beds, that can also be pushed together to make a king. The en-suite bathroom provides a bathtub with in-tub shower (with hand wand), and vanity sink. Grounds: At the back of the property is in-ground heated float pool with trickling waterfall and a spacious sun-deck set with lounge and deck chairs and an outdoor table with sun-umbrella. 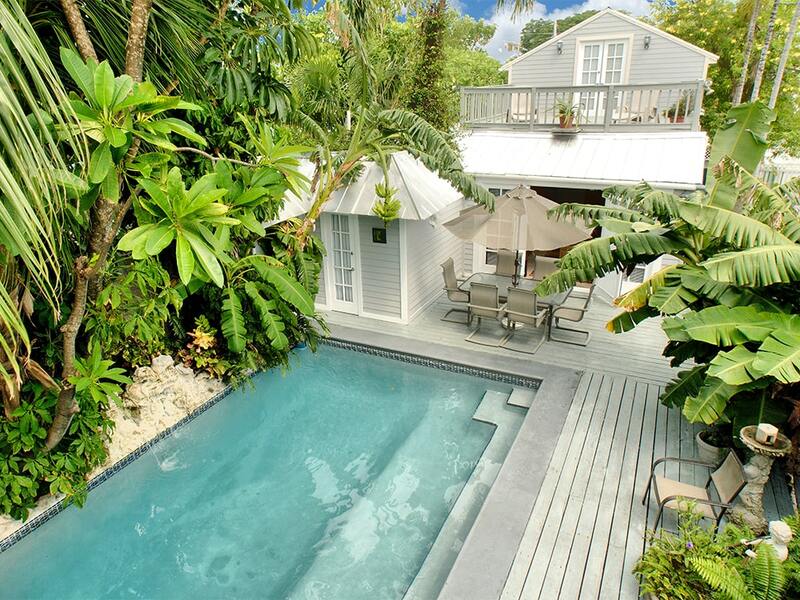 Amenities: Private swimming pool with optional heat. Artistic renovation. 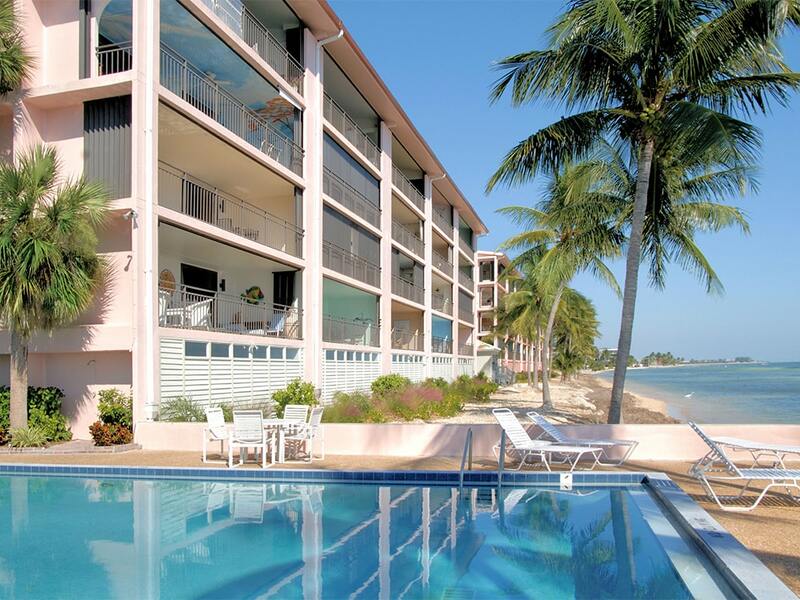 Fully equipped kitchens, central a/c, washer/dryer 3 wall mounted flat-screen cable TVs. (Each bedroom has a TV.) Linens and towels are provided. Catering can be arranged. Maid service can be scheduled. Activities: Downtown Old Town Key West at Mile Marker 0, historic monument location on Whitehead in the 500 block. One short block from Duval Street, one short block from the Green Parrot Bar. From here you're down the street from Fausto’s Fine Foods for grocery shopping, Mallory Square Sunset Celebration, Mel Fisher treasure Museum, Ernest Hemingway Museum, Custom House and Lighthouse Museums, Fort Zachary Taylor State Park, and Key West Aquarium are all in the neighborhood. You’re also perfectly situated to walk to excellent internationally recognized downtown restaurants, night life, popular clubs, the Historic Seaport, and tropical shops. Area: This neighborhood of Key West is the original "island urban" area, at the ‘end of the road.’ When you stay in this neighborhood it’s amazing how much there is to see on each street. The original city island infrastructure was built here to create a diverse array of shopping, offices, entertainment, restaurants, bars, hotels, and churches, and these features are still offered in a modernized mode. There is an impressive display of historic commercial buildings and residential Victorian, cottage, and bungalow style residences. Beautiful tree-lined streets and never ending people watching make you want to walk everywhere and see everything from here. 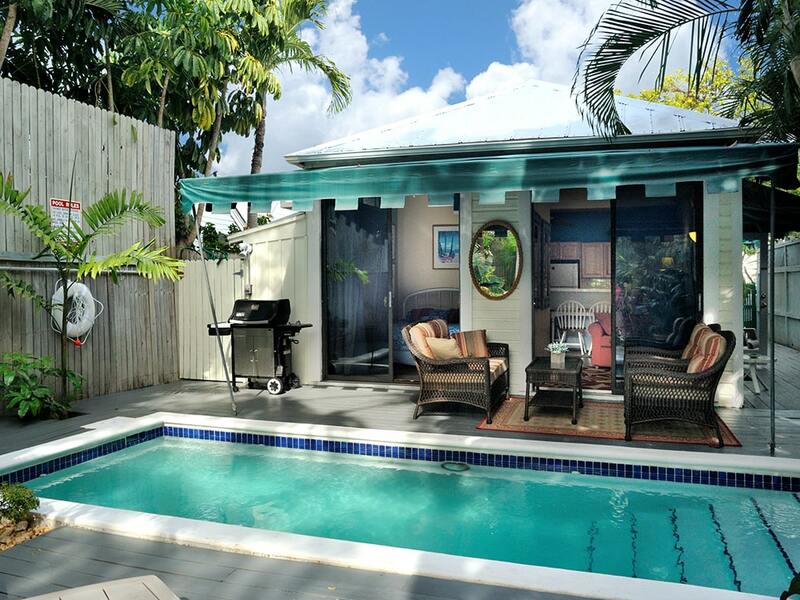 **Notes: This Key West vacation rental is only available to rent 60 days prior to arrival and not more than 60 days out. The 2 bedroom, 2 bathroom, presented here, Key West Mile Zero Suite, is only available to rent, when it is not already rented as part of the larger 4 bedroom property, Heavenly Hideout at Rainbow’s End. If you love this suite, but need to sleep more people, you can rent the property as the 4BR 4BA, Heavenly Hideout at Rainbow's End. Apr 20, 2019 - May 26, 2019 $2200 $500 4 night min. or 3 night min. 60 days prior to arrival. May 27, 2019 - Jun 14, 2019 $2200 $500 4 night min. or 3 night min. 60 days prior to arrival. Aug 9, 2019 - Oct 19, 2019 $2200 $500 4 night min. or 3 night min. 60 days prior to arrival. Oct 27, 2019 - Nov 3, 2019 $2200 $500 4 night min. or 3 night min. 60 days prior to arrival. Nov 11, 2019 - Nov 22, 2019 $2200 $500 4 night min. or 3 night min. 60 days prior to arrival. Nov 30, 2019 - Dec 20, 2019 $2000 $500 4 night min. or 3 night min. 60 days prior to arrival. Jan 4, 2020 - Jan 10, 2020 $3400 $600 4 night min. or 3 night min. 60 days prior to arrival. Jan 11, 2020 - Jan 17, 2020 $3400 $600 4 night min. or 3 night min. 60 days prior to arrival. Jan 18, 2020 - Jan 24, 2020 $3400 $600 4 night min. or 3 night min. 60 days prior to arrival. Apr 18, 2020 - May 24, 2020 $2200 $500 4 night min. or 3 night min. 60 days prior to arrival. May 25, 2020 - Jun 12, 2020 $2200 $500 4 night min. or 3 night min. 60 days prior to arrival. Aug 8, 2020 - Oct 22, 2020 $2200 $500 4 night min. or 3 night min. 60 days prior to arrival. Nov 1, 2020 - Nov 7, 2020 $2200 $500 4 night min. or 3 night min. 60 days prior to arrival. Nov 16, 2020 - Nov 19, 2020 $2200 $500 4 night min. or 3 night min. 60 days prior to arrival.